House for a quiet and relaxing, super view. Kitchen: built in a bar counter with three-burner stove, double sink, worktop, drawers and shelves. Toaster, microwave, coffee. Living room: big table with solid wood, fireplace with benches, sofa, TV Sat (Astra and Hotbird) with slots for cards or prepaid subscriptions. Free Wi-Fi, washing machine. Fireplace to warm your evenings with atmosphere. Bedroom with double bed and bedroom with 2 single beds that can be joined. + BABY BED or brunette bed. Possible 2 children in baby bed (6 occupants). Rooms with lake view. Bathroom with washbasin, toilet, shower. Garden on two levels: 70 sqm, table, chairs and chairs Sternal + Charcoal BBQ and further table (6 seats) in wood under a pergola of grapes, surrounded by park with 70 olive trees, to eat in peace, enjoying the magnificent super view. Parking in the yard of the house closed by gates and railings. The living room offers plenty of opportunities to Domaso - something for every taste. The weather and winds are ideal for windsurfing, kite surfing, skiing and other water sports. Great satisfaction for those who love hiking and mountain biking with exciting routes along which there are landscapes of rare beauty. We recommend a visit to neighboring villages, Gravesend, with its churches, Gera Lario with its port, Colico with the remains of the castle and the castle of Montecchio Fuentes, Dongo where Mussolini was arrested and small mountain villages where you can taste the atmosphere of a time. 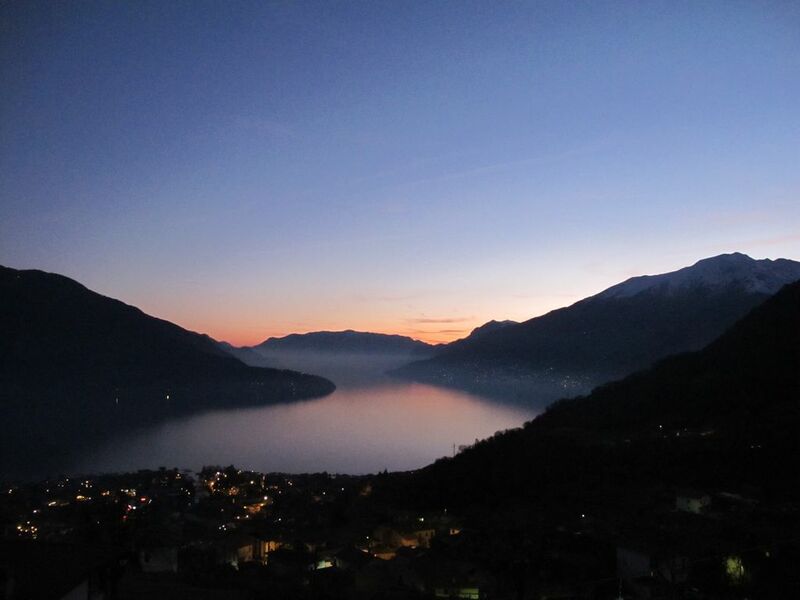 Dream holiday for lovers of good food: the numerous restaurants and trattorias offer dishes based Larian lake fish, local produce, cooked with traditional recipes and accompanied by local wines, or the nearby Valtellina. Not far away is, Menaggio, Tremezzo, Bellagio, recommended to visit by boat, starting from 'landing Domaso. we are available for any information concerning your holiday. Arrivals and departures only on Saturdays, unless otherwise agreed or available. Heating with pricing to consumption. This is a comfortable, slightly rustic property that had everything we needed, a wonderful view and very helpful owners. Highly recommended if you are happy to drive to the top of the hill regularly! We stayed with two children (5 & 6) and two adults for one week in Vercana in this lovely house. It's very comfortable with two bedrooms, a good bathroom and an excellent living with kitchen. The garden consists of two layers with an astonishing view over Lake Como. The owners of this home are very friendly and helpful and offer you a quiet and wonderful place to relax en enjoy a nice stay in Vercana. I would certainly recommend staying in this house in Vercana. Thank you very much beautiful family. Nous avons bien profité de cette semaine dans ce gîte très agréable! Großzügige FeWo, sehr ruhig gelegen, ungefähr 10 Fahrminuten von Domaso entfernt Einmaliger Blick auf den Comer See. Küche ist gut ausgestattet. Wohnzimmer ist eher als Partyraum gestaltet, bei schönem Wetter macht das aber nichts, da man ohnehin dann auf der schönen Terasse sitzt. Sehr freundliche Vermieter. Lauro et son épouse nous ont très gentiment accueillis chez eux. La location est conforme à la description. La terrasse et la grande pelouse qui font véritablement balcon sur le lac sont un plus. L’endroit est très calme. Il faut être préparé à rouler 4 km sur une route pentue et en lacets, ce qui n’et vraiment pas un problème pour nous. Vercana constitue une excellente base pour explorer les sites autour du lac et, plus loin, la moyenne montagne et la Suisse toute proche. Nous aurions apprécié un équipement un peu plus complet dans la cuisine. Hormis cela, une location à recommander sans hésitation. Superb views of Lake Como and the surrounding mountains; located in a residential area surrounded by nature and peace olive below. The apartment is on the ground floor with a sunny garden. 1 km bars, grocery stores, restaurants. 3 km to the center of Domaso with the beaches and all amenities and attractions.